Early attempts at using electronics in making music weren't just meant for amplifying instruments or recording. Translating sound through circuits also inspired attempts to recreate natural sound phenomena like reverberation (reflected sound you hear less than 0.1 seconds after the initial sound) and echo (longer, near-exact repeats of entire phrases). What surely must have mesmerized canyon-wandering humans 20,000 years ago inspired equal wonder among the engineers of the 20th century. Early experiments in echo would come to define the sound of rock and roll's young and unhinged social moment in the 1950s. Echo-drenched vocals and guitars brought the relentless rhythms of early rock and roll into the space age. These days, echo is used to refer to tape–based units, while the effect's more modern incarnation in pedals and VSTs is called delay. Echo tended to sound more like the natural phenomenon, with quickly decaying and short timing between repeats. Technological advances have made unnatural sounds possible, like long durations between repeats or even self–oscillating repeats that grow louder rather than decay (Exhibit A: the Earthquaker Devices Avalanche Run). The story of tape-based echo may have started with the innocent emulation of a natural phenomenon, but it quickly turned into an indulgent exploration of how repeats can be stretched and manipulated for texture and headiness. The Roland Space Echo RE-201 shares more in common with modern delay pedals than Sun's slap back echo, demonstrating just how quickly and wildly that echo craze took off. The earliest echo effect systems used magnetic tape. Tape was cut and spliced to create a loop. Using a reel to reel tape machine, sound would be recorded onto that tape and played back in real time while a singer was singing or a guitarist was playing. Time between the original sound and its echo depended on the length of one of those tape loops and the placement of the “write” tape head and “read” tape head. Differing lengths and strengths of echoes could be produced by manipulating these factors. Electric guitar and recording pioneer Les Paul embraced the early possibilities of echo. He would connect multitrack units together to control a host of echoes in real time, and then overdub himself playing all of the other parts that a song needed. His all–guitar recording technique, making full use of echo, gave him the ability to play without a full band. Around the same time that Les Paul was exploring the technology, European composers exploring the possibilities of recorded music were exploring tape echo as well. Pierre Henry innovated an entire tape–based collage style of classical music called musique concrète, with Karlheinz Stockhausen and the BBC Radiophonic Workshop soon following suit with their own tape–based musics. Guitar echoes come courtesy of tape machines, analog pedals and digital programming, providing a wide array of rhythmic patterns ranging in sound from subtle slapback to wild oscillation. Here is a breakdown of some epic echo units and the guitarists that love them. Elvis Presley - "Baby Let's Play House"
In Memphis, Sun Studios would produce some of the most dramatic echo and delay effects on their landmark 1950s recordings. Sam Phillips, head producer and engineer, utilized two separate tape machines to create his trademark echo effect. One machine would record and playback the dry signal to the second machine which would have other reverb effects in its signal chain to create a slapback echo that would be affected in its length by the speed the tape was played. This blended signal would then be fed back to the master tape. The Keeley Memphis Sun pedal pays tribute to this iconic sound. One of the earliest standalone echo units was the EchoSonic. This amplifier was the step between those jerry–rigged tape echo studio systems and self–contained tape echo effects. On the EchoSonic, the tape machine with recording and playback capabilities was built directly into the amplifier, just like how amps by Supro and Fender had tremolo or reverb. Scotty Moore, Elvis’s original electric guitar player, would use the effect on Elvis’s early material recorded at Sun. By the 1960s, several all-in-one style echo units had been produced. These units would hold a single reel that played on an infinite loop with through multiple play back heads to control the number of taps or repeats, and a recording head. The user could control the mechanisms guiding the tape and the heads to create a number of delay and echo effects of varying lengths and repeats. Each unit had its own peculiarities and potential. The Maestro Echoplex EP–3 was a popular unit for much of the '70s thanks to the unique warmth of its preamp and the nature of its repeating decay. The other famous tape echo unit of the 1970s is the Roland Space Echo RE-201, made unique by its adjustable tape speed. The Space Echo helped establish the sound of dub reggae, the spacey offshoot of reggae pioneered by legendary producers Lee Perry and King Tubby. Lee Perry - "Bird in Hand"
Starting with stripped down versions of popular reggae songs—often featuring just the drum, bass, and vocal tracks—dub reggae producers would mix in dramatic drum breaks, sound effects, and epic Space Echo flourishes a psychedelic soundscape heavy on low end. Towards the end of the 1970s, the early rock and roll and European classical techniques of using tape machines to create echo effects would meet their logical conclusion with Frippertronics. King Crimson leader Robert Fripp worked with the storied producer and ambient music innovator Brian Eno to develop the a system that allowed for delay times so long that the repeated phrases sounded like loops. 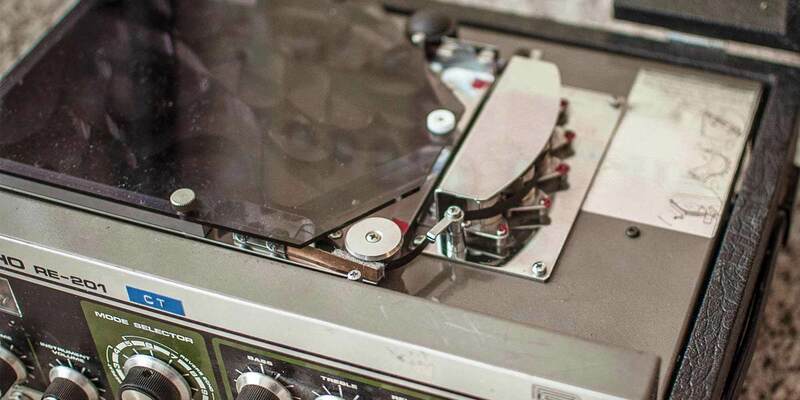 One tape traveled from the supply reel from one machine to the take up reel of the other machine, resulting in the tape from the first machine being played on the second. This played sound is re-routed from the second machine to the first, and the delayed signal is played back while live audio is mixed into it. What resulted were profoundly long delay times that were heard on no other recordings at the time. This innovative sound would be made more easily achievable decades later with the advent of digital delays featuring multiple seconds of delay time as well as loop pedals. For the sentimentalists, though, there are still plenty of ways to get that original tape echo sound. Echoplex tape delay units have been a salient element in the tone of guitar greats since their introduction in 1961. 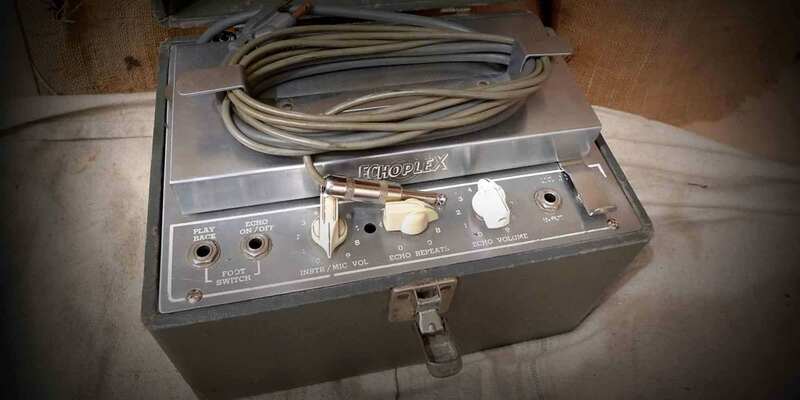 Take a look at some key options to consider if on the hunt for the preamp or echo functions of the one and only Echoplex.